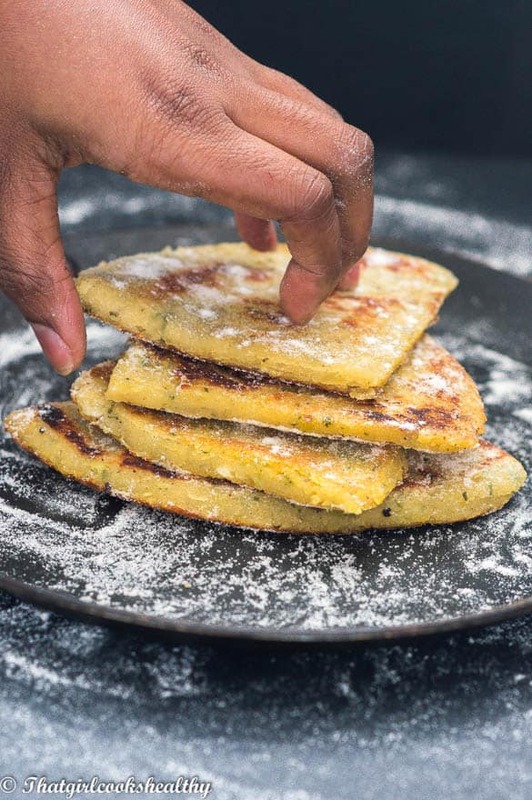 Potato farls recipe – where the Caribbean meets Ireland, a true culinary affair of sweet potatoes, generously seasoned and shaped into potato farls. I’m so excited to share this recipe with you all because it’s another fusion recipe. In case you aren’t aware, I do love mixing Caribbean flavours with western cuisine. I have done so several times already, however, two of favourite recipes are Caribbean style Paella and Thai pineapple fried rice . Both of these recipes are in my top ten most visited/made recipes on the blog. If you haven’t already, I highly recommend giving them a try. I promise you will love them! Anyway, let’s talk farls, okay so you guessed by the title that farls are potatoes, starch enriched and carb loaded. YUP! The recipe to hand was inspired by my many trips to Ireland. I’m a true foodie, in the respect that when I go to another country I like to “live” like the locals. I don’t want to settle for the tourist attractions. I want to see how the local people live, their food, cultural norms etc. This is exactly what I did in Ireland on my very last visit. Most people go to Ireland and visit the capital Dublin. On the other hand, Charla, likes to venture out further a field. I went to the countryside and ate some local food including Irish potato farls which was quite nice might I add. 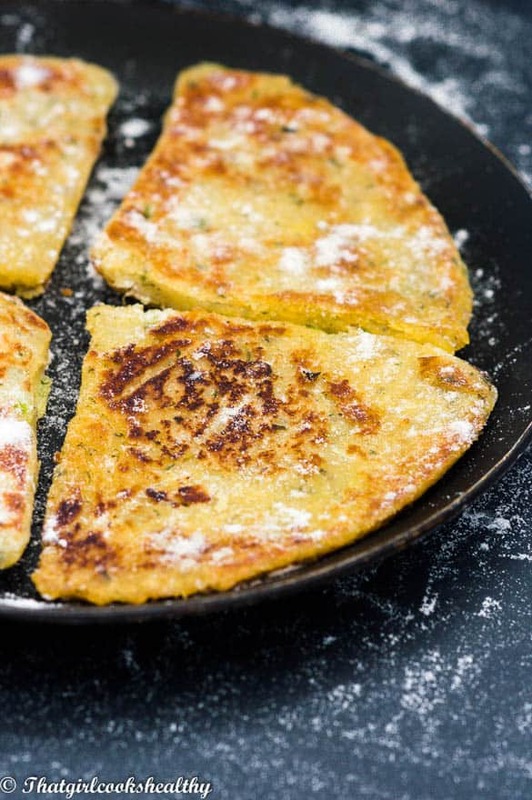 Farls aka potato cakes, or potato bread are one of the local Irish delicacies. Farl originates from the gaelic word fardel which means four parts. This explains why it is cut into 4 quarters upon serving. 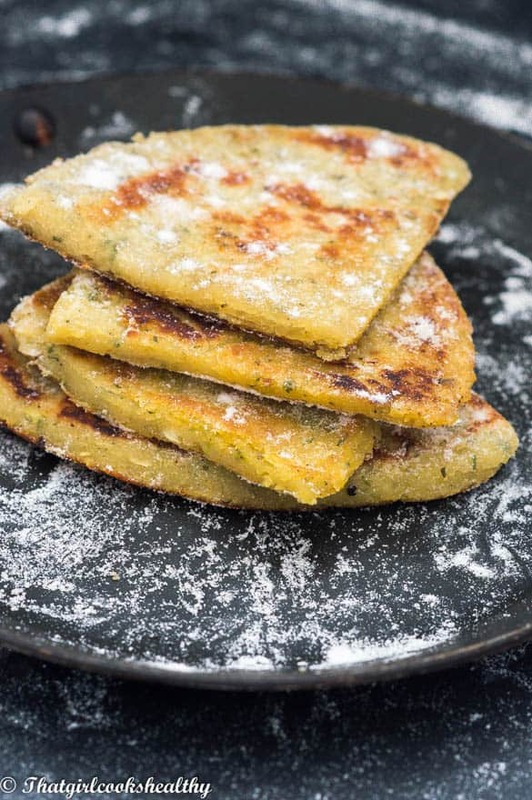 Potato cakes are very simple to make even in their gluten free form. I managed to successfully achieve a 1-1 hassle free flour substitution. Rendering the recipe fool proof and equally as tasty. My choice in gluten free flour was brown rice. I’m beginning to learn that brown rice (albeit not paleo) is probably one of the easiest flours to work with. I also added a splash of plant based milk and dairy free butter to the potato mixture to ensure any dryness would be eliminated. Dry/crumbly texture is a VERY common complaint in gluten free cooking. One that I am only too familiar with and seek ways to combat it. 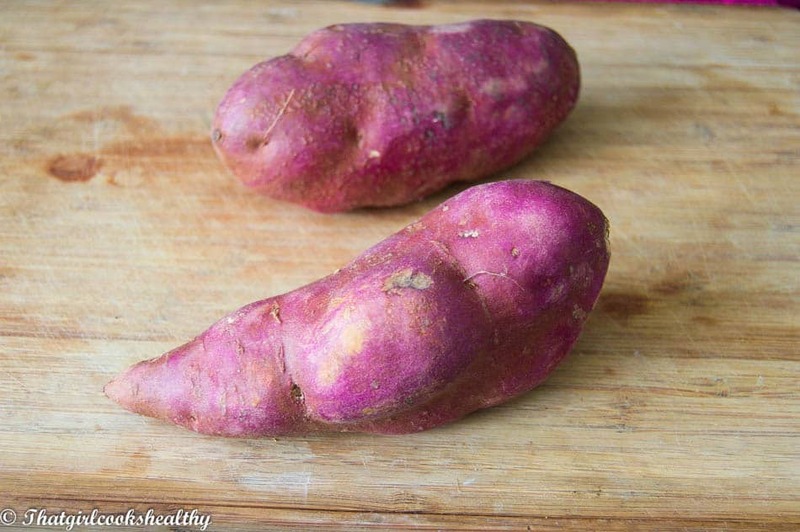 The potatoes used in the recipe are Caribbean sweet potatoes with the red skin as shown in the picture. Unfortuntely, you can’t buy these potatoes in your local supermarket. You can purchase them from any Caribbean/African/Asian grocery store. Two small sweet potatoes as shown, are suffice for this recipe. I boiled mine with the skin on and simply crushed the potato with the skin on. The skin literally peels offs with ease so you can remove and discard during this step. Farls aren’t generally seasoned so this is where the Island flair comes into play – we like seasoning!! be it ultra hot or mild, we hate food that is bland!! I add a few herbs and spices, giving the potato cakes a little kick. I also used my baking tin as a template to outline the disc shape. Can I freeze potato farls? Yes, I would advise rolling out the dough and shaping and cutting the dough. Then store them in a freezer friendly bag ready to cook. You don’t need to defrost them prior to cooking them either. Can I use an alternative to Caribbean sweet potatoes? Yes, If you’re struggling to find Caribbean sweet potatoes then next in line would be regular sweet potatoes with the orange flesh. They would work just fine!! 4, Crush until the potato is soft and fluffy, ready to add to the dry ingredients bowl. 5, Combine the dry ingredients with a splash of milk to create a dough ball. 10. Cook each farl for a few minutes on each side until golden brown. Bring the sweet potato to the boil then reduce heat. Simmer the potatoes on medium heat til tender. Make sure to prick with a fork to determine its readiness. Once cooked, drain off the excess water and allow the potato to cool slightly. Use a potato masher to crush the potatoes, as the potato breaks down the skin should come away. Simply discard and continue to mash the potato until it is completely smooth and lump free. In a separate bowl, add the thyme, scallion, black pepper, pink salt, tapioca starch, brown rice flour, butter and a splash of almond milk. Add the potato to the condiment bowl and knead the mixture lightly. The dough should be slightly sticky but firm enough to roll. Transfer the dough onto a large piece of parchment paper dusted with brown rice flour. Proceed to roll out the dough with a roll pin into to a circle that is 1/4 inch thick. If you are unable to roll the dough into a circle, use a baking tin or template disc and place over the dough and press down to create a circle. Use knife or pizza cutter to cut into four quarter. Any left over dough can be shaped into patties. On medium heat, grease a large frying pan with dairy free butter work in batches and add the quarters to the pan. Cook each side for 4-5 minutes or until golden brown, flip and cook the other side. Dust with flour and serve. I love latkes, I bet these are AMAZING!! Adding this to my list for my next Sunday brunch. These look delicious and so versatile. I’m thinking of trying a sweet version! Wow, I’ve never tried a Potato Farl, but it looks so delicious and full of flavor. Also, it looks super easy too. Gotta try this! They look amazing! I also love that they’re a little portable, and you can take them with you on the go! These sound delicious! Adding this to my menu! Honestly, I am a big sweet potatoes lover, but I have never made mine this way. 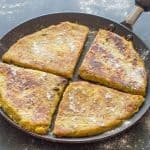 This recipe looks fantastic, and I will be trying it soonest.